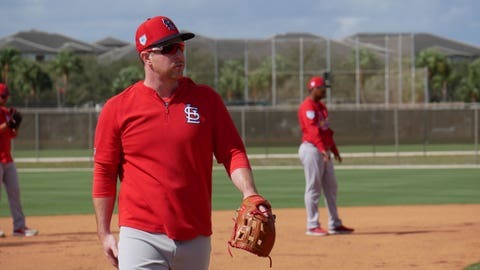 Jedd Gyorko missed most of spring training with the Cardinals. ST. LOUIS – The St. Louis Cardinals will have a veteran bat and versatile infielder back when they play their home opener Friday afternoon against the Padres. The team activated infielder Jedd Gyorko from the 10-day injured list. Gyorko, who was limited to five Grapefruit League games by a right calf strain, last played March 3. Gyorko, a former Padre, has hit 61 home runs since joining the Cardinals in 2016, second only to Matt Carpenter (81) for St. Louis in that time span. Gyorko can play all four infield positions. To make room on the 25-man roster, the Cardinals optioned infielder/outfielder Drew Robinson to Triple-A Memphis. The left-handed-hitting Robinson, 26, an offseason trade acquisition from Texas, opened the season with St. Louis and played in three games, going 0 for 3 at the plate.